The audience view in the Center for Faith and Life auditorium. The Center for Faith and Life (CFL) is the college's main performance hall, which features world-class artists, performers, and speakers, and serves as the home of Luther's worship services. The Center for Faith and Life is located nearby Dahl Centennial Union and across from Valders Hall of Science. During the academic year, the Center for Faith and Life hosts Christmas at Luther in addition to the Center Stage Series of performances. Information for upcoming performances and ticket availability can be found on the Ticket Office website. In addition, the Center for Faith and Life includes offices for College Ministries and Campus Programming. The main level has 746 fixed seats and 134 moveable chairs, and the balcony has 548 fixed seats, for a capacity of 1, 428 with some space for overflow seats available. Because of the many ways in which the auditorium space is utilized, it's imperative to have a versatile stage. The Center for Faith and Life's thrust stage consists of a stationary platform and a hydraulic lift. The platform and lift together are large enough for an orchestra of 85 and a seated choir of 200. The lift can be positioned at the stationary platform level for maximum stage area, at the auditorium floor level for additional seating, or lower than the stationary platform as an orchestra pit. The lift also serves as an elevator for moving equipment to and from the basement. The moveable platform, at the front of the lift, is a seating area with variable position. It can be set below the stage or at the stationary platform level for a level floor from cross aisle to front wall. The three canopies with transparent acrylic panels suspended above the stage are a part of the acoustical design of the hall and can be raised or lowered as preferred by various performance groups. Mounted in the organ balcony, the Martin Luther Tiles, designed and crafted by Robin (Bailey) Nordmoe ’84, commemorate the 500th anniversary of Martin Luther’s birth. The motif is that of geese (left panel) transformed into swans (right panel). The swan signifies the success and acceptance of Luther’s reform as compared to the defeat of John Huss (“Huss” is the German word for goose), a Czech reformer burned at the stake in 1415. In addition to artificial lighting, a ceiling skylight allows natural light to illuminate the front of the auditorium. The natural light can be closed off by pneumatically operated louvers. Rost Memorial Organ located in the Center for Faith and Life. 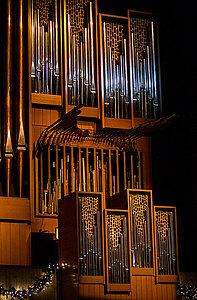 The Rost organ was designed, built, and installed by Robert Sipe of Dallas in collaboration with William B. Kuhlman, then college organist, and Paul Veneklasen, acoustical consultant for the main auditorium and recital hall. The organ was made possible by a single gift from Jeanne Preus Rost ’41 in honor of her late husband, Lawrence E. Rost. A 42-stop tracker-action instrument reflecting classical organ-building techniques in combination with current computer technology, the Rost organ contains 3,142 speaking pipes in 62 ranks, or sets of pipes, distributed over four keyboards, three played by the hands and one by the feet. The instrument is elegantly encased in the tradition of the Golden Age of Organ Building — the 17th century — although the architecture of the case is frankly contemporary in keeping with the basic architectural scheme of the Center for Faith and Life. The main case is made of solid oak, and the console and pedal sharps are inlaid with rosewood. Decorative pipe shades at the top of the case provide visual interest and additional blend within each division. Assistant professor of music Gregory Peterson '83 currently serves the Luther community as college organist. Used as a performance space for soloists and small ensembles, lectures, and Wednesday evening Eucharist when school is in session, this area seats 160 with provision for 40 overflow seats. Named in honor of former dean, vice president, and classics professor O.W. “Pip” Qualley ’18, this lounge is used as reception area for recitals, concerts, and meetings. The bust of Qualley was sculpted by Douglas Freeman ’75. The chapel is open to the campus community 24 hours a day via an outside entrance. Ceramic wall tiles and worship pieces in the chapel were made by former faculty member Dean Schwartz. The stained glass window, modeled after a window in St. Andrews Lutheran Church in Oshkosh, WI, was given in honor of Freda (Struxness) ’48 and Theodor Jacobsen ’42 by their grandchildren. The Sanctuary Candle keeping the eternal flame is a gift from the Hill family in memory of the late Kendra Hill ’95. Outside sculpture on the Center for Faith and Life. The concrete and cedar wood sculpture on the front exterior of the Center for Faith and Life visualizes the tree of life (Revelation 22.2) anchored in the rock of faith (Numbers 20:11, Matthew 16:18, and others). A drainage tile above the sculpture bathes it with the living water of the rain which falls on the roof of the building. It was designed by Charles Pohlmann of Minneapolis. 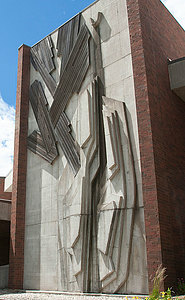 The southeast corner of the Center for Faith and Life is the site of Oedipus and Antigone, a Gerhard Marcks sculpture donated to the college by Ruth (Jensen) ’51 and Wilfred Bunge ’53. The eight-foot-tall, three-quarter-ton bronze casting represents two characters from Greek mythology, both of whom were central characters in three plays (Antigone, Oedipus the King, and Oedipus at Colonus) written by Greek dramatist Sophocles in the fifth century B.C. The work depicts the moment in Oedipus at Colonus when Oedipus prepares to enter a sacred olive grove, where he will come to the end of a hard and tragic life.